Water Purifier or Water Filter - Which is Best? To know which one is the best (a water filter or water purifier), it’s about the phrasing, words, and how it relates to water treatment standards. The term ‘water filter’ is broadly used to describe many water filtration devices. But did you know that not all water filters are alike in their ability to reduce pathogens (a virus, bacterium, or other microorganism)? Not only that, but there is a difference between the meaning of water filter and water purifier when it comes to actual water treatment standards. A water purifier must filter out Bacteria to Log 6 and Virus to Log 4. Most of those water filter pitchers that you might keep in your fridge, or the water filters that attach to your faucet, are water ‘filters’. Meaning that they filter out some pathogens. But there are other choices that are actually water purifiers. They will remove a much greater extent of bacteria (plus viruses). When comparing and deciding about water filters, pay attention to the reduction (99.9999% vs. 99.99%) (and/or Log #’s). The best water filters / purifiers will remove a higher percentage of pathogens and/or virus. Note that a water ‘filter’ doesn’t have to remove any virus at all. Note: Fortunately virus in our water here in the U.S. is not really an issue. 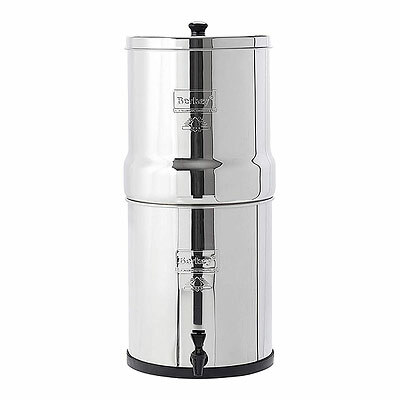 A water purifier which I consider to be one of the best is the Berkey. 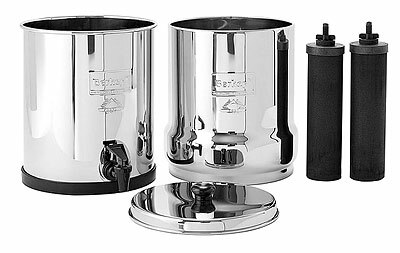 All Berkey systems now contain the Black Berkey Filter elements. And they meet the Water Purifier standard. 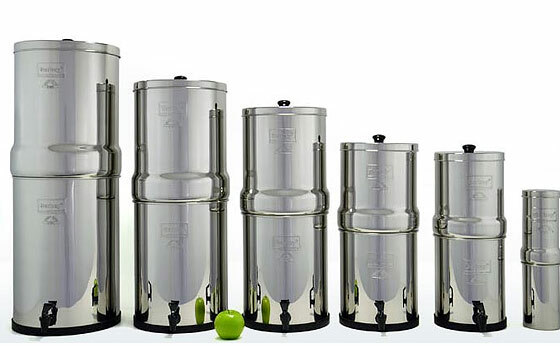 In fact Berkey Purifiers surpass the ‘purifier’ standard. This distinction actually makes Berkey the only certifiable gravity flow water purification system on the market (that I know of). I have been using Berkey for many years. All of our drinking water is purified with their filters. Our bodies are made up of about 75% water. I figure it’s pretty important to take steps that the water we’re drinking is clean and purified! Also, by having a good quality water purifier, I know that in any emergency situation I could easily purify water from other questionable sources that may contain pathogens, bacteria, or even viruses. I believe that a quality water purifier is a very high priority investment for overall preparedness. From time to time I post an article about this (because I believe it’s so important). I tend to ‘push’ the Berkey (because I have long term experience with it) and can vouch for it. The initial investment of any quality product is expensive. But that expense is ‘relative’ when you consider the need for purified drinking water during an emergency situation! Not to mention the everyday health benefit from day-to-day use. Are you on a well? (I am), it’s a good investment! I am on a municipal water, honestly the water quality is awful, literally taste like chlorine at times or it’s smells of…. never mind. UI filter all my direct drinking water through a Big Berkey. I don’t use in in cooking, mainly because I boil the crapo (literally) and chlorine out of the water before I add foods. If I had more time I would probably ‘Purify’ all the water I use, but ya know how it goes. I do have an inline filter on the ‘House Water’ but still “stuff” gets through. I believe that Checy said yesterday he “Pre-Filters” his water, not a bad idea to get most of the gunk out first before it hits those High $$$ filters. Something to think about, do you know how to build a gravity feed water purifier with a set of filters and 2 5-gallon buckets If/When TSHTF? Do you have a spare set of ‘filters’? Yes around $100 a set, but……..how much did ya spend on McDonalds last week? I am new and getting ready to buy a water filter. Does the Berkey remove chemicals as well? Chemicals are a tough one, some of them are long-chain and others not so much, meaning that those “some” can be filtered out. I would greatly suggest you review the product specifications. As far as I know there is only one filtration system that will remove “most” chemicals, but the name slips this old brain for now. BUT it’s a very Very expensive system, wayyyyyy beyond my budget for sure. PS; I have the Big Berkey, and I’m very very happy with it. To remove chemicals, you will need to look into a water distiller. Those are expensive and it takes a long time to process. Here’s an example. What about RO system with carbon block pre-filters? in my experience, this would remove nearly all of the chemical, as the water is being pushed through a ‘molecular sieve’. Yes, apparently reverse osmosis systems with quality carbon filtration will remove a high percentage of various chemicals. I’m actually considering putting in a system maybe this summer. It all looks pretty impressive. A reverse osmosis (RO) unit, depending on the style, contains one, two or more activated carbon filters. On the EPA’s list of regulated contaminants, filter carbon is the recommended best treatment for the vast majority. For the removal of organic chemicals, chlorine and its by-products, pesticides, and herbicides, activated carbon is unrivaled. It is also unrivaled as a taste and odor improver. That said, the Berkey only requires gravity to function (grin). Long ago and far away I had an RO system at home. It wasted about 4 gallons of water for every gallon it produced. It also required a booster pump because local water pressure in my area wasn’t high enough to support an RO sysytem. But perhaps these days those issues have been addressed? Agreed on the wasted water, about 4 to 1. We have great municipal water here, but have the Sawyer bucket purifier for emergency use. They make very good products and should get more recognition from the prepared community. We have one at both locations. I have been thinking of getting a couple more for more backup and possible bartering. I do wish I could get rid of the chemicals they put in our water, just for our health. Personally I do like the Sawyer Mini the best for travel and the “Bags”. just not for home use. But your right, the filtering system on the Mini is very good. Spent most of my career abroad in some places way off the beaten path. Standard issue in almost every locale was a Durastill automatic water distiller with a reserve tank. In some places maintenance staff would periodically clean and descale them, in others we’d do it ourselves. Never had a problem with one and was never gut sick at home. Used it for drinking, cooking, washing vegetables from the market, brushing teeth, cleaning wounds (kids + dogs = scrapes). They were expensive but long lasting and kept the staff and their families healthy. When I worked in West Africa we provided our Peace Corps Volunteers with Fairey (aka Doulton) ceramic candle stainless steel filters. Very similar to the Berkey. They lived in quite primitive conditions and were advised to bring their shallow well water to a boil before pouring it into the filter. Worked pretty well for those who were conscientious. On a deep well now with fine water but have my Berkey and extra candles tucked away JIC. BTW in one country we were not allowed to sell or otherwise dispose of old Durastills as they were too easily converted to distilling liquids other than water. We have municipal water like a lot of you guys. Ours is off a tri-county system, they have to add a lot of chlorine to make sure it is sanitized across the whole system. Installed a reverse osmosis system, with carbon block pre-filters. Maybe $150 at the orange box building store. It does take out nearly everything including chemical. The downside is that it takes water pressure to work. Still, we get 12 gallons of pure water for drinking and cooking a day. I like the Berkey units, the kids have one in town. Do not know how much chemical they remove, but I would think that the carbon filters would grab a lot. Nice thing is they do not need municipal water pressure to work. In a SHTF situation have already thought what I would do. I have two large well pressure tanks in the shop yard. Can rig up a tank to pressurize with a bicycle pump and push batches through the RO unit if I have to. I may also try and save money to by a Berkey, but there are a lot of other things on the list ahead of that. BTW, you can really taste the difference between RO treated municipal water and untreated. NRP- don’t know about Blue, but Jake will only drink RO water at the house, nothing else. Of course, he also drinks irrigation water, but that’s a dog thing, right? The Berkey chemical filters will take out a lot. Chlorine and Fluorine are on the list of what they remove. The primary (black candle) filters will take out a lot of it, but not all. Check their website. How about under the sink filters, I see one that filters to .5 microns. Note: There’s a difference between “absolute” and “nominal” ratings when it comes to filter media ‘microns’ (pore size). If the filter specification says (for example) 1.0 micron nominal, that means that most (say, 95% or whatever) of the filter media will block particles down to 1 micron. Absolute ratings mean that all of the filter media will block down to 1 micron. This is why I like to find specs that indicate percentage (and Log equivalent). For example, a filter that blocks 99.9999% (6-Log) of bacteria pathogen. It’s more meaningful. if you look on the net, ‘water filtration vs. size of common contaminant’ there is a great graphic. Basically, RO filters out the most contaminants. Like you said, units like the Berkey only need gravity, but I wonder if they catch all the chemical. Just food for thought. BTW in regards to your future RO unit, I have used under sink 5-stage RO units from Watts and APEC with great results, both on municipal and well water systems. Just my 2 cents. Thanks. I will look into those brands. Okay, I have no idea what you are talking about, please explain what a “5-stage……” is? a 5 stage RO filter unit has five stages of filtration including the actual reverse osmosis step. there will be a spun poly pre-filter say good to remove 5 micron particles, then two carbon block filters to remove large amounts of chemical and metals, then it goes through the RO membrane, which is truly a “molecular sieve” – only water molecule sizes go through. the final water goes through a smaller carbon filter as it passes up to the water spigot on the sink. This is the way a lot of the ‘under sink’ configurations are made. They are normally good for about 12 gallons a day, but you can buy larger ones, even up to “whole house” size. Units are made by a number of companies like Watts, Apec, GE. you look online, you can find a number for sale. Under sink type units are running about $150-200. Replacement filter cartridges run about $35-50, we replace ours once a year for the two of us. When we had kids at home, every 6 months- 1 years. the RO membrane will last a number of years, but can be replaced too. Yes they do use water to flush the RO membrane clean. Several Gallons for every one used. I just routed the small flush water tube into the garden, the little birds loved it, they had water all year long. (no it did not contain a lot of contaminants. The units back flush the RO filter every time you use the water inside. You take a gallon for cooking, several come out the flush line with maybe 1/3 more contaminants than the in-going water). Just food for thought. Besides being a plug for the Berkey Water Filtration System, which is a good product, the artical fails to mention that water in the US is some of the best in the world. Municipal Water Systems are for the most part policed (Detroit being the exception) and levels of toxicity both natural and man made are monitored. Sodium Hydroxide (Chlorine) is added to prevent biological growth in the system. All water for consumption both human and pets should be 100% filtersed to remove the chlorine. Your kidneys were not designed to process this much chlorine, which by the way is highly toxic. The standard Brita or Pure Filters will do this just fine. You can check your filter performance using a simple pool chlorine tester, before and after samples will be starteling. In addition the Brita and Pure will take out a large percentage of Heavy Metals, not mentioned in the article, which are also highly Toxic especially to children. If you live in Farm Country or border a Golf Course which are known for the use of chemicals and insecticides, especially if you use well or spring water you should ask your neighbor (s) for a list of the products they are using and have your water tested at least semi annually for those specific substances. If your neighbor is not cooperative with that information he may have to report his usage to your State Conservation Dept who may assist you. If you find that your water does not meet either your or federal standards, there are various filter systems available to greatly improve the product. Some are expensive and perhaps part of that can be recouped from the culprit, but that is a long drawn out affair and will not make many friends. But we are 95% water, and our long term health is based on our water consumption. If you find that you require a more elaborate filtration system you should do your research, avoid snake oil salesman and carpet baggers, and get what you need. It is not Rocket Science, or maybe it is? Do you realize this article is read by more than just people that live in the US? Could it be that someone somewhere could also use this information???? OR maybe we are so narrow minded that outside the US is none of our concern whereas the water IS a problem and needs purification?? You have any idea how many in the world die from complications of ‘bad’ water? Is it not Flint Michigan that still has hundreds of miles of Lead Piping as the main water source for hundreds of thousands of people? Heck just do a net search on the number of Water Failures in the US alone. OR the number of people that are dead each year from Bad Water. ” More than 5 million people die each year from diseases caused by unsafe drinking water, lack of sanitation, and insufficient water for hygiene. In fact, over 2 million deaths occur each year from water-related diarrhea alone”. Somewhere on this site you will find a map that Ken J had in an article about water contamination in the US. It showed different areas where there is arsenic in the ground water. I would suggest that you find a map and its data so you know if our water supply is as good as you believe. I am not being snarky it is just a fact. Thank you for your comment, although it does sound a little condescending. Most of the folks on this site are well versed in the information you shared. I find it amusing that you admonish us on how safe our municipal water sources are so safe, then tell us we should filter it to make it safe for consumption. Okie dokie. As this site stresses self sufficiency and survival techniques, we focus on life’s necessities, water being one those. I personally, chose Berkey after much research and comparison shopping. My goal was not so much focused on treating/filtering municipal water, although that was a consideration, but rather on assuring safe water from questionable sources if water procurement became a problem. I winced when I realized the initial investment in a Berkey system was going to set me back $200+, but reading it’s history as being developed to purify the vilest sources possible in Africa, and it’s performance in removing impurities, I viewed it as the answer to my quest. Might interest you to know that readers and followers of MSB tend not to be a bunch of uneducated, knuckle dragging ignorant rubes. Rather, you will find many folks with advanced degrees in the sciences, years experience in self reliance and survival techniques. Most have first hand experience in these pursuits. We also have folks that are just getting started. We tend not to pretend we know it all. We ask questions to those that may have answers. We respond to each other’s questions respectfully. If we disagree, we try to find solutions with out tearing each other down. We are like an extended family……that has never met each other in person. With that in mind, welcome to the conversation. Sorry, did not mean to offend anyone. There is a lot more to water quality than meets the eye, literally. I have been an MSB customer for years and enjoy the articles and comments. I chose to add to the conversation today as I was stuck on my commuter train. As far as the 3rd world goes they need a half pint of chlorine, a Saywer type Filter and a BPA free water jug and perhaps a 4 quart stainless steel pot which we could probably supply to each family for less than $20. This along with an educational pamphlet would provide a years potable water for a family of 8 and greatly reduce the aforementioned sickness and death. BTW, welcome to the comment side of MSB, you know how it goes, some of us get passionate about a conversation. Not upset over your comments. Sorry to hear you are stuck on a commuter train that would distress anyone, as NRP said what a nightmare. We are a preparedness blog/website. And as such, one of the most important aspects of preparedness is having various means to obtain, procure, purify – safe drinking water. Not necessarily for ordinary times. Rather for situations, circumstances when water may not be pre treated. – A temporary municipal supply issue where a water main broke – contaminating the water supply for a time. – An earthquake tears up some of the underground water pipes – thus contaminating the water supply. – Flooding contamination of water supply. – Daily use for someone’s well water or spring water supply. – Emergency usage of pond, lake, stream water for drinking. Safe drinking water is very important. By weight, the average human adult male is approximately 60% water. That figure varies based on a number of things. Sometimes I’ve referenced 75%. Perhaps of interest to some regarding ‘chlorine’ in the water supply. Incidentally it will measure approximately 0.5 ppm depending on your locality. It’s what keeps the pathogens from ‘growing’ in all those pipes.